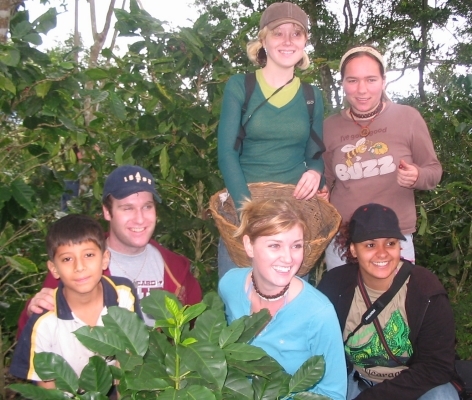 Since 2006, have led annual (except 2008) study tours to Nicaragua, as a credit-bearing course called Geography of Coffee. This page is for sharing what we have been learning on those tours, and for letting successive groups of students know what to expect. You can now continue the exploration at my the main coffee page and visit the tasting page if you are anywhere near campus each April, but Matagalpa/Jinotega stuff is all right here! This is the most common question I get about the tours, mainly because the last time Nicaragua was in the news, it was because of a civil war. That war ended in 1988. Nicaragua is a country with some serious challenges. This tour is not easy, in terms of creature comforts or the uncomfortable lessons we learn about social justice. But it is as safe as travel in a developing country -- or probably any country -- can be. We have worked with the same local guides every time since 2009. These are people with families of their own who are as inherently cautious as I am -- this is an adventure and a challenge, but heath and safety are high priorities. Students or family members with concerns are free to contact me with questions. More than 80 students have done this trip so far, and most are eager to return to Nicaragua -- as quite a few have done! The map above shows the places that have been included in the 2013 and/or 2014 study tours, with just a few photos of each. More photos are found at the year-by-year links above. What started as an opportunity to visit one coffee-growing community has been expanded and refined over the years to give a deep and eclectic understanding of many aspects of the geography of coffee in particular and of development in general in Nicaragua. The 2015 ITINERARY is based on the places visited in 2013 and 2014. It is subject to some fine-tuning, but most of these places will be included in 2015, if not in exactly the same order. Pricing is not yet determined, but should be somewhere between $2500 and $2900. There is a modest differential between BSU and non-BSU student pricing. In 2014, the prices were $2400 and $2600. We do not know what effect airfares will have on the 2015 pricing, but we endeavor to keep the price as low as we can. When the final price is posted, it will include transportation from Bridgewater to Boston (we travel at very odd hours, so most people use this), airfare, all travel within the country, hotels/hostels/homes, all meals, and all guides and admissions. It also includes three credits as GEOG 295, which meets some requirements in the BSU core curriculum, geography, and LACS programs. Pricing does not include souvenirs, sandboarding, alcohol, or gratuities. Nicaragua Nexus The BSU Program in Nicaragua is just one of many projects, programs, and partnerships between Nicaragua and New England. Visit Nica Nexus to get connected! "To know the unexplored of northern Nicaragua"
After running the tour twice with standard, Managua-based tour companies, we are pleased to be working with Matagalpa Tours this time, a tour operator specializing in the coffeelands of the north. On previous tours, the city-based guides sometimes had more culture shock than my U.S. students, so traveling with experts from the region will be a welcome change for 2009. The Coffeeland Landmine Victims' Trust connects the coffee industry to landmine victims throughout the coffee-growing areas of the world. Unfortunately, this includes the Contra War area of Nicaragua. I look forward to working with the Trust during the 2009 study tour. Our journey will take us back to Ben Linder's grave in Matagalpa, but this time we will also go to the Ben Linder café in Leon. This café was established with the help of Deans Beans. It honors the martyred North American engineer while helping farmers and victims of land mines. 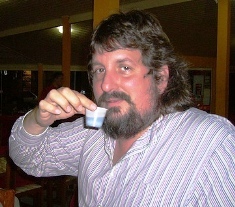 It is also a source of something rare in commercial establishments in Nicaragua: a decent cup of coffee! See the Managua to Matagalpa page for stories from our 2006 journey to the coffee lands of Nicaragua or the Matagalpa Reprise page for highlights from 2007, including a lot of insights I missed during the first trip. Canadia journalist Matthew Kadey joined our 2007 tour. He took excellent photographs and published "Nicaragua: Ecotourism allies with fair trade in Central America " in Fresh Cup magazine. See more professional photos from throughout Matagalpa on Matt's Flickr account or see my less-than-professional photos in my 2006 Flickr set or my 2007 Flickr set.